Last week 13 new geoparks in Africa, Asia, Europe and North America received UNESCO Global Geopark Label. Thus, the world network now numbers 140 UNESCO Global Geoparks in 38 countries. On 19 April 2018, the meeting of the Kazakhstan National Committee on UNESCO Global Geoparks was organized at the UN House in Almaty with the support of the UNESCO Almaty Cluster Office. During the meeting, members of the committee discussed the status of Mangystau geopark nomination, as well as other potential sites to be considered for inclusion in the network, including Burabay, Altyn-Emel and the Aral Sea region. In addition, the participants discussed how to better link the preservation of geological heritage, sustainable development and prospects of geotourism in Kazakhstan. 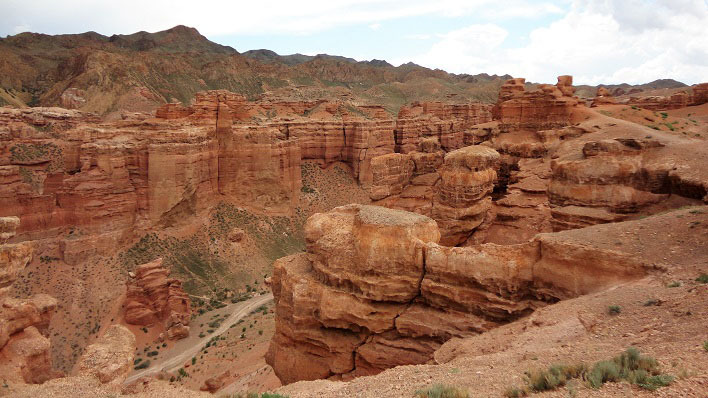 Kazakhstan, as well as Central Asia as a whole, is rich in unique geological and geomorphological sites. However, despite this great potential, there is not a single geopark as yet in Central Asia. It was noted that a shift in thinking in terms of “classical” geology for mining, and the esthetical value and knowledge on the history of Earth, which geological sites of Kazakhstan provide, should be promoted. The UNESCO Almaty Office proposed to organize a follow-up meeting with a wider group of partners on awareness-raising on geological heritage of the country and its potential for regional development, undertaken in close partnership with the Kazakhstan National Committee on UNESCO Global Geoparks. UNESCO Global Geoparks are territories that promote geodiversity through community-led initiatives to enhance regional sustainable development, notably through sustainable tourism. For Central Asia, geoparks can make a significant contribution to the economic development of the countries, if properly used as sites for promotion of natural tourism. Besides, geoparks help monitor and promote awareness on natural resources management, climate change and natural hazards. The UNESCO label helps designated sites and their inhabitants enhance the value of their geological and human heritage and boost awareness raising activities. It also serves to share experiences and best practices within the framework of the Global Geopark Network.